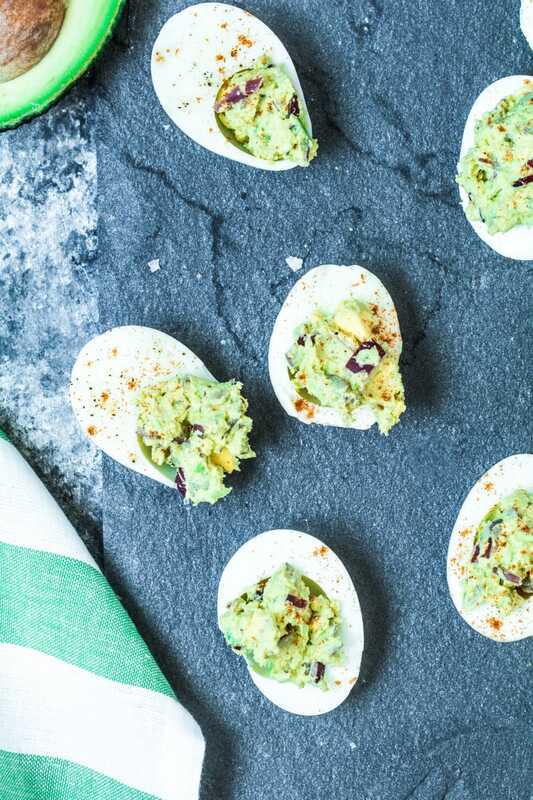 Crack into these delicious Avocado Deviled Eggs with your family and friends this Easter Sunday! Happy Tuesday! I did not get around to posting yesterday sooo how was everyone’s weekend? Busy, I’m sure. I had a pretty relaxing weekend – didn’t go anywhere or have anything planned to do around town. My brother and his wife had an impromptu BBQ on Saturday night and I brought these deviled eggs…everyone seemed to really like them so I thought hey, might as well put them on the blog! 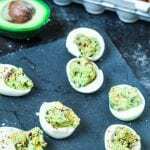 These 2-bite appetizers are typically high in calories, fat and sodium so I revamped my recipe by including the avocado and omitting the mayo. I am personally not a fan of mayo anyways so the classic deviled egg has never been appealing to me! This really is a healthful appetizer because it has healthful fats, vitamin A and B vitamins too. YUM! Halve the boiled eggs and remove the yolks, carefully set the yolks in a bowl and place the egg whites on a platter. Add the avocado to the bowl with the egg yolks and mash until mixed. Mix in the lime juice, onion, mustard, salt and pepper, garlic salt. Stir together to combine. Spoon the mixture into the egg while halves and sprinkle chili powder or paprika on top for color. I always thought deviled eggs were really hard to make. I am not sure why I had this thought but they just seemed “fancy” to me. In reality…deviled eggs are SO easy! The hardest part is probably boiling the eggs and making sure when you remove the shell the egg whites still look nice and pretty. I wrote a post on how to make the perfect hard boiled egg every time that might help you out with this recipe too! No time to look now? Pin this recipe for later! What are you making this Easter? Any family traditions? I’d love to hear! Did you make this recipe? Tag @krolls_korner on Instagram or send me a pic, I’d love to see! Looking for easy and healthy recipes? Head over to my Pinterest page to get inspired! You can also find me on Twitter and Facebook – follow along for nutrition info and more recipes. Yay for Mayo-less deviled eggs, way to change the game! Loving the new pictures, cool to see the finished product after watching your editing process in your IG stories. Happy Easter! Thank you SO much! Always learning, always growing! 🙂 Hope you had a great Easter! 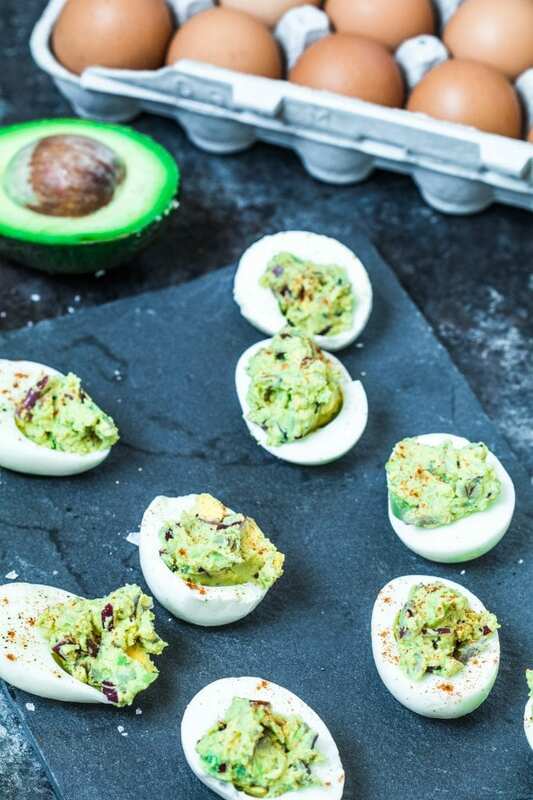 I can’t think of anything better than avocado to add to deviled eggs. Bravo!